This morning I have discovered this piece by Mark Karlin which gives a very interesting and alternative view of bullying. No matter what your personal politics are, I think everyone should have a read of this. What causes bullying in the United States? 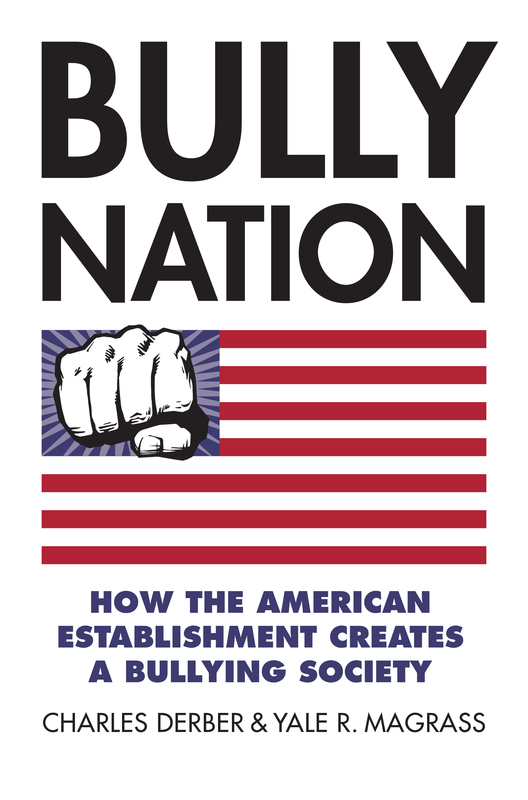 In Bully Nation, Charles Derber and Yale R. Magrass show how US inequalities of power, militarism and aggressive capitalism make both personal and institutional bullying commonplace. Click here to order the book from Truthout and learn what we can do to stop this insidious trend! The following is an interview exploring the systemic problem of bullying in US society. Truthout speaks with Charles Derber and Yale R. Magrass, authors of Bully Nation: How the American Establishment Creates a Bullying Society. Mark Karlin: We often approach bullying from a single perspective. For instance, someone might start a campaign to stop bullying in the schools. The subheadline in your book, however, indicates that bullying cannot be stopped by isolating it: How the American Establishment Creates a Bullying Society. How did you come to see this as a systemic cultural problem? Charles Derber and Yale R. Magrass: Bullying has been a means of controlling people, putting them in "their place," for perhaps as long as there have been humans. Until about 20 years ago, it was dismissed as "normal," a rite of passage that children and adolescents must go through and "get over." Some endure relatively little of it -- perhaps they are bullies themselves -- and it leaves little long-term impact. For others, it is a trauma that leaves lifelong scars. For the most part, the discourse on bullying has been controlled by psychologists, who see it as a problem for individuals who need therapy, but we need to look at why it is so entrenched; do powerful people and institutes have an interest in encouraging and perpetuating it? We live in militarized capitalism. Capitalism assumes competition -- winners and losers. Militarism requires violence, aggression and submission to authority. Bullying builds these very traits. Psychology is inadequate to understand the cause and power of bullying. Indeed, bullying is about power, and psychology hardly has a concept of power. It is all about individuals changing their attitudes. Sociology and politics are much better at understanding power. The 1950s sociologist C. Wright Mills spoke of the "sociological imagination," where he argued you cannot separate "personal troubles" from "public issues." We need the sociological imagination to understand bullying -- how are children raised to blend into militarized capitalism? What kind of school system does militarized capitalism need? How do school authorities encourage a student culture which prepares for militarized capitalism and sees bullying as a "normal" part of life? I am intrigued by the phrases in the book: "militarized capitalism" and "capital bullying." Can you explain the difference? Not all capitalist societies are militarized (think Costa Rica or Sweden), and not all militarized societies are capitalist (think Russia or Saudi Arabia). We sometimes forget this because the US has so seamlessly melded militarism and capitalism, creating "militarized capitalism." Militarism is, inherently, a bullying force, and independently, capitalism is very much a bully system. So all militarized states, even those not capitalist, are bullies. And the same is true of capitalist states which are not militarist. Charles Derber (left) and Yale R. Magrass. (Photos courtersy of Charles Derber and Yale R. Magrass)But when you have a militarized capitalist system, the effects are multiplied. Both the militaristic and capitalist elements of the system create bullying -- and the synergy creates super-bullying. That is one of the reasons the US is the most powerful and dangerous bully nation. The term "capital bullying" -- which is the title of Chapter 2 -- refers to the bullying inherent in capitalism. Capital bullying refers to the bullying carried out by capitalist elites even in non-militarized societies. The capitalist class (including corporations) bullies workers, consumers, suppliers, corporate rivals and suppliers. Of course, Marx built his whole theory of capitalist exploitation as a bullying relation between the capitalist class and the working class. Since he developed this in his masterpiece,Capital, we thought it apt to call such bullying "capital bullying." How does the 2016 election, and specifically Donald Trump, provide an illustration of "bully nation"? Donald Trump embodies most people's image of a bully. With his insults, put-downs and even violent threats, he looks like an over-sized, over-aged schoolyard bully. But again, we must be careful not be overly psychological. There is a more important sociological-political question: why is he so popular, at least in some circles? People often say Hitler was crazy, but that begs the question: how did a lunatic gain millions of followers and take over one of the most advanced countries in the world? Although they are brutal and cruel, bullies are often admired. When Trump had his reality show -- "The Apprentice" -- people cheered when he announced "You're fired!" In a time of anxiety, when wages have been stagnant for decades, when white males fear their status threatened by women and people of color, when third-world peoples can defy the United States in Vietnam, Iraq and Afghanistan, some may feel a need for a protector who will "make America great again." By "great," Trump means America must feel free to go anywhere it wants, do anything it wants, anywhere in the world, with impunity. Nobody can be allowed to mess with America. A strong-man -- a bully -- is needed. In order to protect you, he must make sure no one can challenge him -- he must be able to destroy you. The more effectively the bully bullies, the more secure you will feel. You can even feel empowered in his glow; you can be part of the dominant caste, the winning team. Personally, your life may not be great, but at least you can be part of something great -- the world bully. Can you discuss a bit about racial and class bullying? Capitalism is bullying; it is competition -- winners and losers. Class inequality is at the core of capitalism. The weak deserve their fate. Anyone who can be bullied deserves to be. The poor don't have the stamina and the will. They must submit to the power of those who have the strength to build industries, fortunes and empires. The strong are meant to rule the weak. For the economy to thrive, the 1% must be free to bully the 99%. Racial bullying is not essential to militarized capitalism, but it is useful. The United States began when Europeans crossed the Atlantic to seize the lands of Native Americans and annihilate them. They were free to do so because the Natives were defined by Europeans as inferior uncivilized people, unfit to be free, have their own culture and their own land, maybe even unfit to live. The Europeans were chosen by a higher force. They had "Manifest Destiny" to bully, dominate and prevail. At first, the Europeans tried to enslave the Natives, to bully them into doing their work for them, but that proved impractical as the Natives died out or escaped into lands that they knew better than the Europeans. Instead, the Europeans turned to Africans who again they defined as less-than-human, child-like creatures, incapable of taking care of themselves, who needed the European's civilization and protection. They had to be bullied for their own good but 20 million were forced to cross the Atlantic in the "Middle Passage," with half dying on the way. Black slavery may have made poor whites even poorer, deepened class divides and may have enhanced class bullying, but at least poor whites could feel they were part of the bullying race. However, it made a select few very rich, with more wealth coming from slavery than from land, crops, railroads or factories. Racial bullying has reinforced class bullying. It has divided the 99% and brought many within the 99% to identify with the 1% rather than challenge them. When slavery ended, racial bullying against Blacks continued in the form of Jim Crow segregation, and even when that ended, racial bullying subsists with evidence like police brutality against Blacks. Racial bullying helps account for the popularity of people like Donald Trump. Many people probably don't think of environmental bullying. Can you explain the concept? In our era of catastrophic climate change, it is hard not to think about "environmental bullying." But while all militarized capitalism creates devastating environmental effects, we did not find any works that use this term. In everyday life, of course, most know that some people bully their dogs or other pets. People also realize that there is a culture of animal bullying -- like the deadly dogfighting business that Michael Vick turned into a huge news story. And most people are also aware that agribusiness -- whether Purdue, Tyson or Cargill -- turns bullying of animals into a merciless profit engine. But while it is quite obvious that animals are bullied, it may seem less clear that plants or soil or rocks can be bullied. Bullying implies the victim can experience some form of consciousness. While many Indigenous cultures believe all of life and nature have spirit or consciousness, Western societies have constructed a nonsentient view of plants and all nature, permitting humans to attack and destroy all forms of life. Science now shows that many plants do, indeed, have remarkable forms of consciousness and communication. Recent studies of trees show that they communicate by intertwining their roots, and actually survive and prosper by building "tree communities." Scientists studying forests now talk of "lonely" trees which become isolated and die quickly. But what about rocks? Can you bully a rock? If you hack it apart or blow it up, will it suffer or feel pain? This seems less clear, so we introduce the concept of "environmental bludgeoning." It is our term to describe human violence against natural objects that may not have consciousness. The book explores the relation between environmental bullying and bludgeoning -- and shows how militarized capitalism fuels both, now threatening to destroy not just humans but all species and perhaps, nature itself. In your epilogue, you discuss some new ways to think about reducing bullying. Can you describe a few of your ideas? The conventional psychological view -- that bullying is simply a form of personal disorder or mental illness -- leads to the idea that therapy is the only solution. This leads to a virtual industry of school counseling -- giving jobs to shrinks, psychologists, social workers and teachers -- in an effort that has not stopped the persistence of bullying by kids (in the schoolyard or online). We are hardly surprised, since the therapeutic approach overlooks the main root of the problem. When kids or adults bully, they are responding to the norms or incentives of their companies and their militarized society. They are not "sick" or maladjusted or "under-socialized;" they are rather already well adjusted to the larger system and don't need therapy to become further adjusted. We discuss the rise of a significant "anti-bullying" movement in the schools and the larger society that has good intentions but remains plagued by its psychological focus. Bullying will remain rampant until we throw out the conventional wisdom and focus on the roots of the problem. Learn how the American establishment creates a bullying society. That means using the "sociological imagination" and seeing that many personal troubles -- and bullying is a prime example -- are actually social problems. The best way to reduce bullying is to change our society by reducing its militarism and moving toward a less capitalist system. Social democratic countries, such as Sweden, have low rates of bullying. That is because they are not militarized and can be viewed as what Bernie Sanders called "democratic socialism." Their universal social welfare, and strong labor movement, reduces the inequalities of wealth and power that are the systemic causes of bullying. Such "regime change" in the US will happen only when social movements against militarized capitalism and social hierarchies based on race, class and gender grow stronger. Such movements are widespread in the US, but they are fragmented and need to work together (what [Derber] calls "universalized resistance" in a forthcoming book). Since bullying is a systemic problem, it takes movements seeking broad systemic change to reduce bullying. Some anti-bullying groups in the US -- growing out of targeted groups, such as women, African Americans, Latinos, Muslims, members of the LGBTQ community and the disabled -- are beginning to build recognition that bullying is a social problem. But to be effective, they must universalize their movements. This means working together to reduce all social hierarchies and create an alternative to militarized capitalism that ensures equal rights and power and respect for everyone.